New Delhi Chief Minister Calls India's Smog-Choked Capital A 'Gas Chamber' : The Two-Way The situation is so bad that doctors are describing it as a public health emergency and calling for the government to order an evacuation of the city. 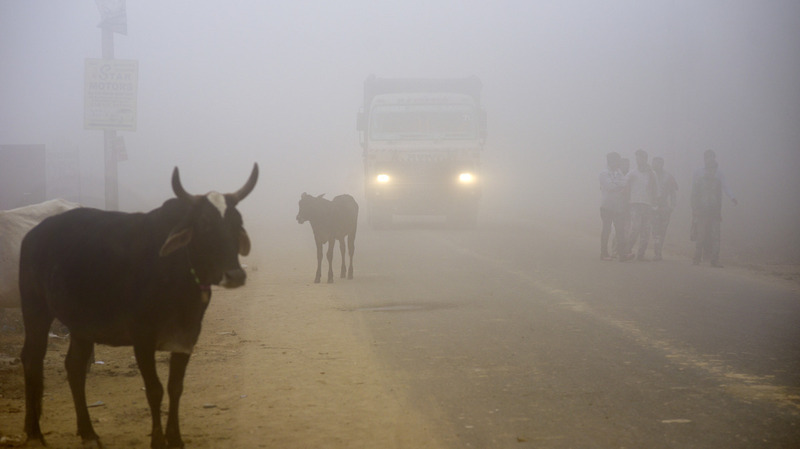 Cattle stand by the side of a road as a truck drives through smog in Greater Noida, near New Delhi, on Wednesday. A toxic smog that is blanketing the Indian capital, forcing some of its schools to close and bringing traffic to a halt, has doctors in New Delhi urging the government to declare a public emergency and order the population to leave. The enveloping brown cloud is being blamed on farmers in the neighboring states of Haryana and Punjab, who NDTV says, are "burning crop residue, an annual tradition to clear fields that combines with vehicle and industrial emissions, as well as road and construction dust." Chief Minister Arvind Kejriwal, who called his city a "gas chamber," was seeking meetings with the adjacent states to clear up the issue — and the air. Volunteers distribute face masks in New Delhi on Thursday. 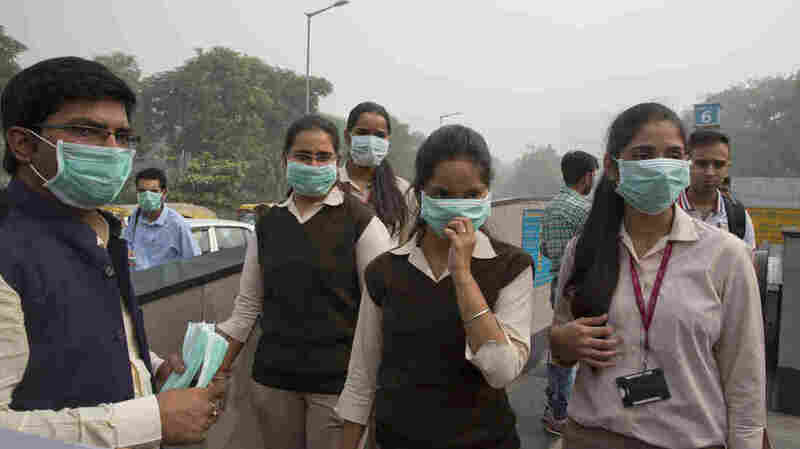 "The situation as it exists today is the worst that I have seen in my 35 years staying in the city of Delhi," Arvind Kumar, a lung surgeon at Sir Ganga Ram Hospital, was quoted by NDTV as saying. "As a doctor, I have no problem saying that the situation today is a public health emergency. If you want to protect people, we should be ordering the evacuation of Delhi. Closing down all schools. Closing down all offices." Randeep Guleria, the director of the All India Institute of Medical Sciences, which is the city's leading hospital, is also calling the crisis a public emergency. According to The Hindu newspaper, Guleria is "[advising] the elderly, children and patients with respiratory and cardiac problems to avoid strenuous activity, which leads to inhalation of greater volumes of minute pollutants, early in the morning or late in the evening." The news channel says that by midday Thursday, the level of carcinogenic pollutants in the air in the city of 20 million people was roughly 10 times the reading in infamously polluted Beijing. As NPR's Julie McCarthy has noted, a 2015 study found that half of Delhi's 4.4 million schoolchildren have diminished lung capacity. The New York Times writes that "even by the standards of this city, this week's pollution has been alarming, reaching levels nearly 30 times what the World Health Organization considers safe. On Tuesday, the government decided to close primary schools and on Wednesday the closings were extended to all public and most private schools." Last month, Julie reported that India's Supreme Court imposed a ban on the sale of fireworks for the annual Diwali festival in an effort to curb pollution levels in Delhi.